Last week I upgraded my apartment hunting from investigative research to active outreach. And already the scammers have spotted my optimistic innocence. Fortunately, I’m still jaded enough to see reality behind rainbows. Or maybe I’m just too jaded to appreciate the beauty of a rainbow. Honestly, I don’t know what’s what anymore. Only a few rentals and sublets have begun advertising January availability. So as I comb through November and December move-in dates, my options are still limited. But scattered throughout the various sites are rentals for 2011. Beginning with craigslist, I started reaching out to several advertisers – mostly short-term, furnished sublets. I didn’t receive any responses for a few days. 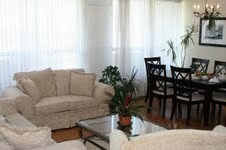 But on Friday I finally received a response regarding a 1-bedroom for 600 euros (about $850). The price would be perfect – though surprisingly low. And based on the Google street view, the apartment’s location would be dreamy – around the corner from the park and a bike ride from the University. Based on the pictures, it’s super cute, inside and out. The message I received indicated that the place is still available. She just wanted me to answer a few questions about myself, for fear of renting to another bad tenant. She said she’s working for a US-based shipping company, spending much of her time in Philadelphia. She also said a number of other things. But her English wasn’t clear enough for me to get everything. But I took the Philadelphia connection as a good sign. I responded with my answers. And she wrote back within the hour. I had given her the impression that I would be a good tenant. Her lawyer (in the UK) also agreed that my application looked good. So they were ready to give me the keys to the apartment. Wait, what? The deposit will be 600 euros. They want me to send this to the lawyer in order to receive the keys and the papers for the apartment. Nope, nope, nope. That’s shady. I told her I would need to see more information, her lease or proof of ownership, the lease she would want me to sign, proof of her id, her lawyer’s details, a blood sample, and her mother’s cell phone number. No way I’m sending any euros to some strangers from craigslist without some assurances in place. She immediately came back with a copy of the lease I would sign (with my name already typed in), and scans of her passport (she’s Swedish) and her attorney’s passport (he’s British). Okay, that’s impressive. And with this proof of id, she indicated that as soon as I send the money for the deposit via Western Union, her lawyer would send everything to me. But even though I have scans of passports, how do I know these are real people? These could be fake passports. I’m still not comfortable. And Western Union? I demanded to see proof that she has a right to rent this apartment. Her lease? The owner’s information? Something. And I refused to send the money via Western Union. It’s just like sending cash. No way. I offered to send a certified check once I was comfortable with the situation. At this point, I was confident that it was a scam. She was clearly trying to trick me and would have had me show up with all of my stuff, holding a mailbox key, trying to open an old couple’s front door. Since I was onto her scam, and coming back so intelligently and sharper than any of her previous victims, I didn’t expect her to respond. A few hours later, she responded with a kind, though slightly more agitated tone. This time she explained that she owned the apartment with her husband. After his death, it became all hers. 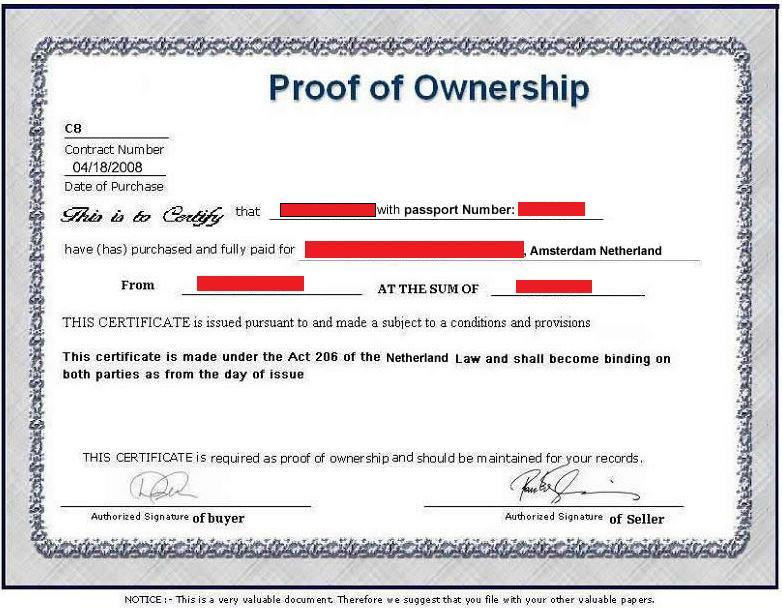 She attached the scan of a “Proof of Ownership” certificate, including the full address and official-looking signatures. So now not only do I have two passports and a certificate, I have a sad story about a young woman’s dead husband. But how do I know this is a real certificate? And the husband could be the part of the story that gets someone like me (with a soft spot for dead people) to get up and go to Western Union. Am I falling into her trap? I haven’t responded to this last message. I’m kind of out of rebuttals. I can’t think of anything else she could provide that would make me feel better. All the while, I’m wondering if I’m blowing my shot at living in a cute apartment, by myself, in a great location, with an affordable rent. Am I going to regret being so paranoid? Or will I end up 600 euros poorer, hating myself for not trusting my inner skeptic? I’m sending a message to the University to get some advice. I’m also open to feedback from any of you on this. I’m at a frustrating loss on whether or not to proceed. I say fake. Why would an official document of the Netherlands misspell ‘Netherland’? Press for a more secure means of payment that can be traced and/or stop payment/reimbursed for fraud. Yup. You’re totally right. I tried pushing for a certified check or even a certified paypal account. But she said it would take too long. Super shady. And confirmed as a scam. Thanks for the advice! I have an experience in Dec. On 12/8 wired $290 to Eidburgh UK, after I had applied for a house for rent in a small town in Vermont. I was to receive the keys and month to month lease by Fedex the following day. I lost $319 with charges. In our case, we are two senior citizens who because of health problems needed to move closer to my daughter, We needed to discuss advance direcives, and she and my son are the only family we have. We were in the middle of a medical crisis, and neurologists at the Medical Center Hosp of Vermont, had agreed to see my husband myself. We were offered a home for $500 a month, seems the going rate. I had wanted to set up a professional website that might get more attention, as I know there are many more people who are too embarrased to report themselves. There is a connection, that there is a connection between the Craigslist, apartments wanted, Western Union, and through Patrick the guy who emailed me, he claimed he was going to Nigeria for one year. That did not raise a flag until I went back and read emails. I did file a police report with our small town dept. and he said it was the second complaint he had in our small town of 3000, a young couple, with a five month old baby, had lost their home to foreclosure, and then lost their last %500 to someone in the UK, wired through Western Union. What is frustrating, is I haven’t been able to get the MSM’s attention, and I have reported it to the police in UK, America, his email carrier, his ISP tracked back to Go Daddy Software in Scottsdale, so I filed a complaint with the sheriff there. No one seems to want to put together the pieces of the puzzle. There are millions of people looking for apts, and most landlords require credit checks, so these people are going to post on Craigslist apartments.wanted. Soon they get connected by someone who claims to have an apt. they ask the money usually $500 be wired to the UK, and in my case there seems to be a nigerean connection. I have just complained to HOmeland Security, as well as the FBI terrorist watch lists. Someone has to do some serious research of the Western Union connection, because they must have photo ID’s cameras, and if the money is being routed to the same area of UK, they should be able to set up some kind of trap. I really question the liability of Craigslist and Western Union, if they know there’s this problem of fraud, and continue to allow it to go on. I would love to see a professional website set up. I will tell my story and share emails, I may be old and foolish to have done this, however I was dispirate to get us to find an apartment near my daughter in case my husband needed brain surgery. I hope we hear from more people, I know they are there, and if nothing else I want to get even and shut them down. AWFUL!!! So sorry to hear your story. I hate to say I also recently got scammed again. I have another post I’m going to put up in a couple of days…but it’s the worst feeling when someone so evil takes advantage of people with good intentions and genuine needs. I also haven’t been able to find anyone to listen or care. From the way law enforcement treats their victims, you would think what these terrible people are doing is legal. Anyway, keep me posted. I’d be happy to contribute to the cause! I should add this, my fear is not just the fact that people are being robbed, it is the possibility that the money is being collected in flats in the UK and then being filtered to Nigeria, a known terrorist supporting country. We do not want another terror attack, funded by our own Americans who are down and out.